This is the story of an amazing Rochester grocery store...and an item they used to sell for parties called The Sandwich Loaf. What is it, and why should we travel back in time for it? Let's find out. Until 1997, Barlow Foods was the big-deal grocery store in town. That's when HyVee bought 'em out and it became HyVee Barlow Plaza. 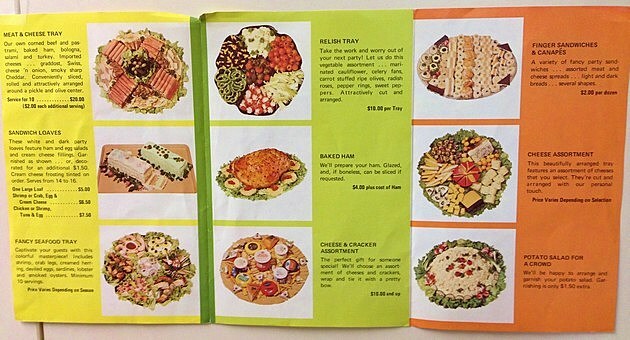 Let's hop in a time machine so you can order from this amazing brochure. It's filled with food from land and sea...and one item from somewhere else entirely. The Sandwich Loaf! You'll love The Sandwich Loaf! What is a sandwich loaf? First we must peruse the brochure. A gastronomic tour, you might say. There's no date on the brochure, but Barlow Foods opened in 1969, and sandwich loaves were popular in the 60's / 70's (according to this site), so that narrows down the date we'll need to travel to. Mmm...imagine a nice big tray filled with seafood, creamed herring, and sardines. Why, after a few hours in the sun, hungry relatives will have their fill and, you'll never need to worry about them messing up your nice clean house again! Invite your neighbors, and they'll be green with envy! The meat tray actually looks pretty decent , and at only $20, it's a steal! And then we come to reason for this post. The Sandwich Loaves. Does it look appetizing? Not to me, especially the sickly green loaf, but a ton of reviews on many recipe sites say they're really good! For instance, the AllRecipes.com recipe gets four stars!